No fluff, no jargon, and no pretension. When we present you an idea it will always be crisp and simple—so simple that within one-minutes time you can recount it to your friend and then that friend to theirs. With this simplicity as our golden standard, we founded our Three Pillar model. These are three crucial consumer needs that when effectively targeted convert views to action. They are as simple as EEE: Enjoyment, Emotion, and Engagement. Without an air of excitement breezing from your brand, no other text matters. So in creating our copy, we strive to first understand your audience. In doing so, we get real people to review our work—through our consumer network—to ensure real results. This information makes our copy both amiable and relevant to those who you want to care. Humans are not rational—we are emotional. Hence why when we are done, our words deliver an authentic reason to care. This comes because your passion and purpose are our ink. As we write, each word enunciates both who you are and the value that you will impart. Since come end day, what matters is not the 'what' but your 'why'. Selling starts before your pitch and after your introduction. Using this, we founded our final pillar on the principle that trust drives action. Because when you create genuine copy, your message shifts from unwelcome noise into an audible offer. And since repeat purchases beat solo sales, our process will always hold this sincerity central. We pitch our consumer-centric model and stand by it. 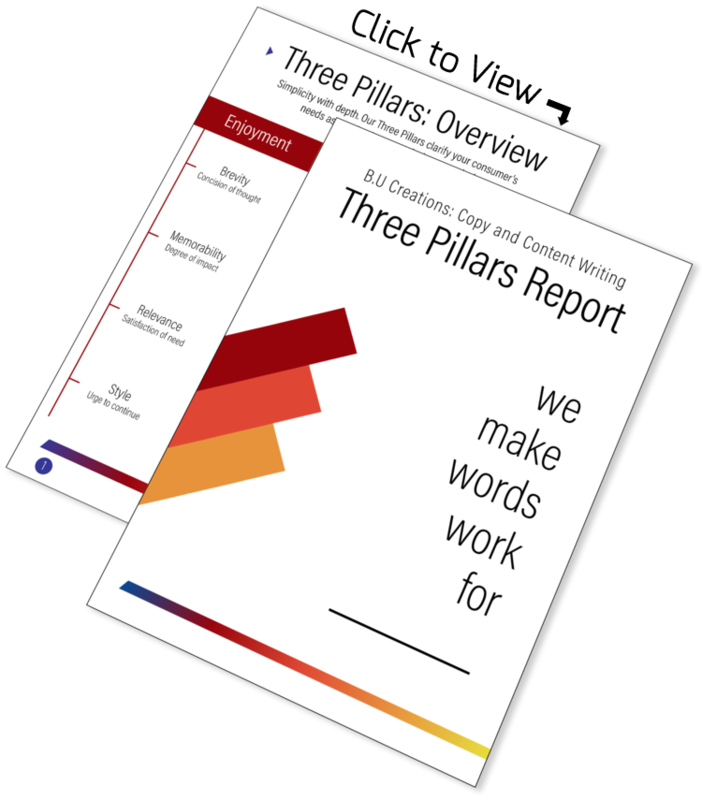 Upon completing our client application phase, you will receive a personalized Three Pillars Report. Each complimentary report has been written by myself to analyze your present copy using three comprehensive dimensions. You will receive actionable advice and precise points that indicate where your next steps should take you. There are zero commitments associated with this report. Our goal when designing it was to create an impactful package that provides you real benefits without any cost. Because regardless of your decision, we want to leave a positive mark on your brand. This token showcases the quality of service that both you and your consumer will grow to expect with B.U. Creations. Each of our pieces has been carefully composed to meet individual and industry needs. This process takes time, and as such, we do not rush in favour of client volume. When we work with you, our attention will be yours—and yours only. You will contribute and you will learn, but in the end your vision shine. We test our writing on real people to determine how it will impact your consumer base. Not only does this embed confidence in our process, but it also saves you later funds and headaches by directly assuring your intended result. Our metrics are designed from an academic background to limit confound and maximize utility. Through this process, we provide words that are proven to elicit precise outcomes. No matter your audience, business, or industry, our strategy can work for you. The system that we are currently architecting will include a diverse sample of people who are incentivized to provide honest first-impressions of our work. Because of this, you can trust that the writing we deliver has been personally tuned for your consumers—and not pulled from a generic swipe file.